If you have pets, you should know there are many foods and plants that will poison them: Avocados, raisins, onions, garlic, macadamia nuts, grapes, chocolate, caffeine, alcohol, lilies, and poinsettias, among others. My brother’s poodle (Pierre) had to have his stomach pumped with that charcoal stuff last year because he found his way into a Christmas gift basket that contained chocolate. The damage caused by poisons to pets is often irreversible and can lead to death or chronic and acute conditions such as kidney failure. Take care of your pets this holiday season and keep them away from the stuff that humans eat. Thankfully, Pierre the dog made it through that ordeal…and my kitties, Neymar and Caipirinha, are fine, too. All of the aforementioned has a bit to do with the recipe below. The recipe contains onions and raisins, two ingredients that are toxic to dogs and cats. Never let raisins/grapes fall on the floor when you have pets! Most pets shun onions so you don’t have to worry as much about those. The day/night before you prepare this dish, place the codfish filets in a large bowl with cold water. Change the water at least three times over the course of 12 – 18 hours. When ready to cook, lay the codfish filets in a deep and heavy pot. Pour boiling water over the codfish, cover the pot and let sit for 20 minutes. The codfish will cook in the hot water. No need to turn on the stove. Remove the codfish from the pot and break into small pieces, removing the skin and any stray bones. In a very large pot, place layers of potatoes and codfish, alternating with the onions. Distribute the other ingredients between the layers. I mixed all the other ingredients in a bowl and added them as a sauce to each layer. You can also just distribute the ingredients item by item, as you wish. Cook, uncovered, on high heat until the mixture starts to boil. Reduce the heat, cover and cook for another 30 minutes or until the potatoes are done. Serve with some good bread or on a bed of rice. Chegou a época das festas. A nossa casa fica cheia. Fazemos jantares e reuniões, bebemos vinho e cerveja…e quando faz frio…tomamos um chocolate quente com biscoitos. Cantamos, rimos e brincamos. É nesta época que os meus gatos viram uns terrores. Eles ficam felizes porque passo mais tempo em casa. Você nem imagina o trabalho que dão. Na semana passada, de madrugada, tive de levar o Neymar e a Caipirinha para o hospital porque estavam vomitando e passando mal. Provavelmente ingeriram plantas venenosas. A brincadeira custou $1,400. O Pierre, poodle de meu irmão, também ja foi internado porque comeu chocolate. Felizmente todos passam bem. Escrevo tudo isto para alertar as pessoas que tem animais e avisar que existem muitas comidas e plantas venenosas para os seres queridos peludos. Por exemplo, as uvas passas, cebola, o alho, chocolate, álcool, café, abacate, etc. 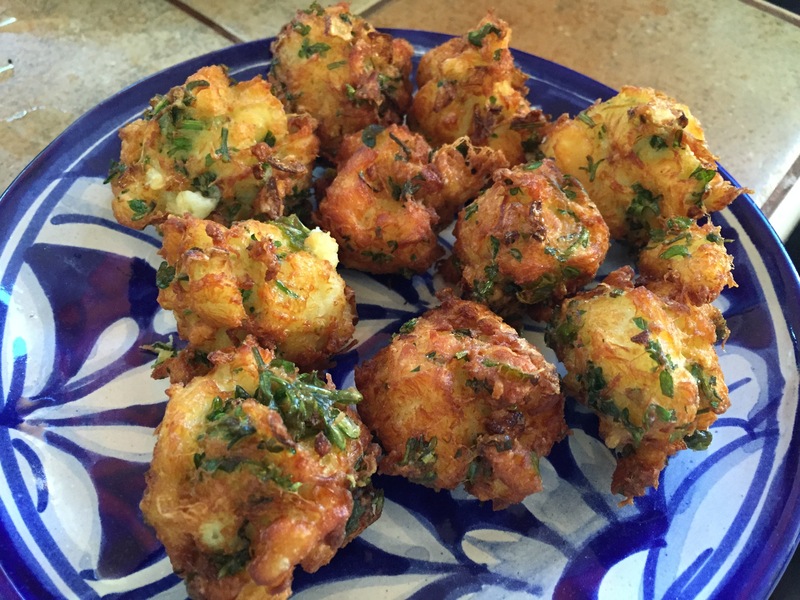 Quando for preparar esta receita de Bacalhau, não deixe nenhuma das uvas passas ou cebola cairem no chão. Na noite antes de preparar o bacalhau, deixe o bacalhau de molho na água fria. Troque a água pelo menos três vezes durante a noite ou de manha. Coloque os filets do bacalhau numa panela e jogue agua fervendo por cima. Tampe a panela e deixe o bacalhau cozinhar na água quente sem ligar o fogo. 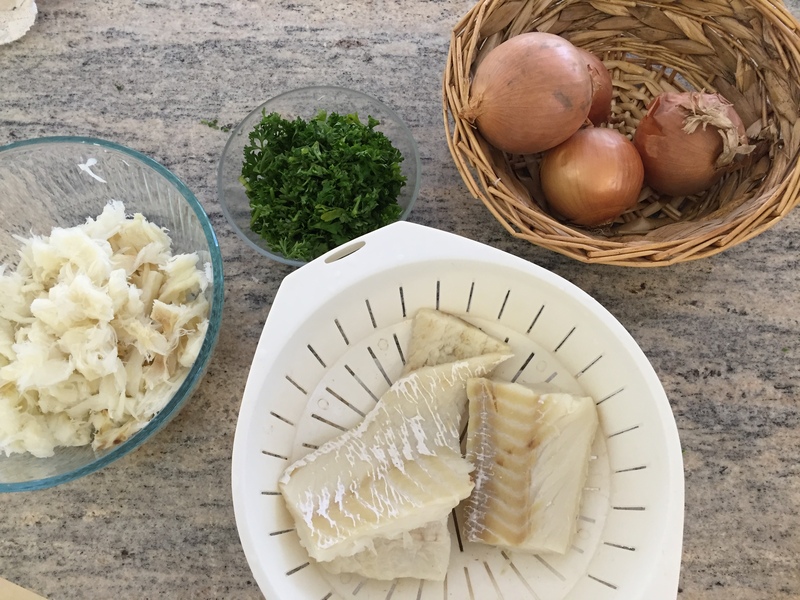 Retire o bacalhau da água e desfie (em lascas).Ponha o bacalhau e as batatas numa panela grande, funda e pesada alternando com os demais ingredientes. (Fica mais fácil se juntar todos os demais ingredientes numa tigela e despejar sobre cada camada de batata e bacalhau.) Cozinhe no fogo alto até ferver. Diminua o fogo e tampe a panela. Cozinhe por uns 30 minutos ou até as batatas amoleçerem. Sirva com arroz ou um bom pão.